A Delta IV rocket was launched by United Launch Alliance on Wednesday night, prior to successfully deploying the WGS-6 satellite for the US Air Force. Liftoff from Space Launch Complex 37 at the Cape Canaveral Air Force Station was on schedule at 20:29 EDT (00:29 UTC on Thursday). WGS-6 is the sixth satellite in the US Air Force’s Wideband Global Satcom system. Originally named Wideband Gapfiller Satellite, WGS was envisioned as an interim program to bridge the gap between the Defense Satellite Communications System (DSCS) and the advanced Transformational Satellite program, which has since been cancelled. Funding for WGS-6 was provided by the Australian government in exchange for access to the Wideband Global Satcom system. Australia was the first country other than the United States to join the WGS program; other countries including Canada, Denmark, Luxembourg, the Netherlands and New Zealand have since joined, jointly providing funding for the WGS-9 satellite expected to launch in a few years’ time. The initial WGS constellation consisted of three Block I satellites. USA-195, the first to be launched, was carried into orbit by an Atlas V rocket in October 2007. USA-204 and USA-211 followed in 2009, on Atlas and Delta rockets respectively. Even before the first launch, however, the planned size of the constellation had already grown – two further satellites were ordered in November 2006 and launched as USA-233 and 243 in January 2012 and May 2013. The WGS-1 to 4 satellites are located at 174.8 degrees east, 60 degrees east, 12 degrees west and 88.5 degrees East respectively, over the Pacific, Indian, Atlantic and Indian oceans. The WGS-5 satellite, launched in May, is still undergoing on-orbit testing, after which it is expected to enter service at 52.5 degrees West over Brazil, in view of the continental United States. The WGS-6 satellite being deployed by Wednesday’s launch was ordered when Australia joined the program in October 2007, days before the first satellite was launched, bringing the planned constellation up to six satellites. With a contribution of between 700 and 825 million US Dollars (776-930m Australian dollars), Australia funded the satellite and the additional infrastructure required to enlarge the constellation. Since WGS-6 was ordered, four more spacecraft have been procured, bringing the eventual constellation size up to ten satellites. The next launch is scheduled for 2015, with further satellites being launched annually until 2018. WGS-4, 5 and 6 are Block II satellites, which are fitted with RF Bypass equipment, allowing higher bandwidth signals to support Unmanned Aerial Vehicle operations. Other than this, they are identical to Block I satellites. 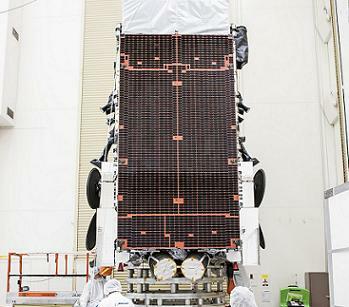 Built by Boeing, each WGS satellite uses the BSS-702HP satellite bus. Expected to operate for at least 14 years, each six-tonne (5.9 imperial tons, 6.6 US tons) satellite is equipped with X and Ka-band transponders, with signal frequencies of around 500 and 1000 megahertz respectively, providing nineteen independently-targeted coverage areas. An R-4D apogee motor will be used to maneuver the satellite from the geosynchronous transfer orbit which it will be launched into to its operational geostationary orbit. It is also equipped with four XIPS-25 ion engines, which will be used to finalize its operational orbit, and for station-keeping. 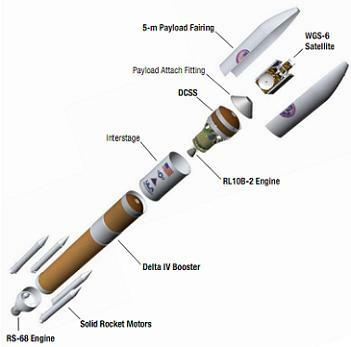 The rocket tasked with deploying WGS-6 was a Delta IV Medium+(5,4); flight number Delta 363. 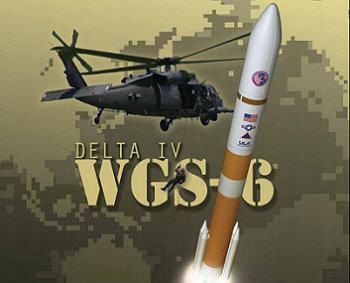 Delta 363 was the twenty third flight of the Delta IV and the fourth to use the Medium+(5,4) configuration – whose three previous flights deployed WGS-3, 4 and 5. The launch came two months and two weeks after the launch of WGS-5; the shortest turnaround to date between two Delta IV launches from the same pad. The Delta IV is a two-stage cryogenically-fuelled rocket, with both stages using liquid hydrogen as propellant; oxidised by liquid oxygen. The first stage, or Common Booster Core, is powered by a single Aerojet-Rocketdyne (formerly Pratt & Whitney Rocketdyne) RS-68 engine. The second stage is a Delta Cryogenic Second Stage, powered by an RL10B-2 engine, also produced by Rocketdyne. Depending on the rocket’s configuration, one or three Common Booster Cores burning in parallel, and a DCSS with a diameter of four or five meters may be used. For the Medium+(5,4) configuration, the rocket consisted of a single CBC, and a five-meter DCSS. To increase thrust at liftoff, the first stage was augmented by four GEM-60 solid rocket motors. The first milestone for the launch was the ignition of the first stage engine, five and a half seconds before the scheduled T-0. Once computers verified that the engine is burning nominally, the solid rocket motors ignited, and two hundredths of a second later Delta 363 lifted off to begin its journey into space. A series of maneuvers began seven seconds after liftoff, orienting the vehicle on an azimuth of 100.97 degrees and pitching over for the climb to orbit. Flying east-south-east over the Atlantic, the rocket passed through max-q fifty seconds into the mission. The four solid rocket motors burned out and separate in pairs. Two of the motors were equipped with movable nozzles, allowing them to contribute to the rocket’s attitude control through thrust vectoring. The other pair had fixed nozzles. The fixed-nozzle motors burned out first, approximately 91.2 seconds after liftoff, with the others following eight tenths of a second later. The first pair of solids – again the fixed-nozzle motors – separated from the rocket 100 seconds after launch; separation of the second pair occurred 2.4 seconds after the first. With the solids gone, the RS-68 continued to power the rocket into space. Three minutes and 27.5 seconds into the mission, once Delta 363 had cleared most of Earth’s atmosphere, the payload fairing separated from the nose of the rocket, exposing the satellite to space. Four minutes and 47.8 seconds after liftoff, the first stage exhausted its propellant and its engine was shut down. This event, Main Engine Cutoff or MECO, was followed approximately 7.2 seconds later by stage separation, with the CBC falling away to burn up in the atmosphere as it reenters – any debris will fall into the ocean. Following staging the RL10 extended its deployable nozzle and begin its prestart sequence, with ignition occurring thirteen seconds after separation. The RL10’s ignition begin the first of two burns to be made by the DCSS during the WGS-6 launch. The first burn lasted 16 minutes and 4.3 seconds, however the onboard computer was able adjust the burn times to the performance of the engine – as was required during last October’s GPS launch where the RL10 underperformed. Assuming a nominal first burn, engine cutoff was followed by a seven minute, 50.2 second coast phase. Once the coast phase was complete, the RL10 was restarted for its second burn, lasting three minutes and 8.3 seconds and marking the final phase of powered flight. After the burn ended, Delta 363 coasted again for nine minutes and 6.7 seconds before it deployed WGS-6 into its geostationary transfer orbit. 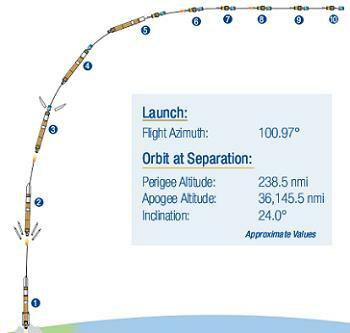 The target orbit parameters for spacecraft separation are a perigee of 441.7 kilometers (238.5 nautical miles, 274.6 statute miles) an apogee of 66,941 km (36145.5 nmi, 41595 mi) and 24 degrees inclination. The Delta IV, along with the Delta II and Atlas V, is operated by United Launch Alliance, an company formed in December 2006 to provide launch services for the US government. The launch of WGS-6 was the seventy-third to be conducted by ULA, and the sixteenth Delta IV that the company has launched. It was the second Delta launch of the year, following WGS-5, and the seventh for United Launch Alliance. In total, Delta 363 was the tenth US launch of the year and the forty-second or forty-third overall, depending on the accuracy of reports of a failed Iranian launch in February. The next Delta IV is expected to launch from Vandenberg Air Force Base later this month, carrying the classified NROL-65 payload for the US National Reconnaissance Office. Widely expected to be the last KH-11 optical imaging satellite, NROL-65 will make use of the Delta IV Heavy configuration. Only one more Delta launch is expected in 2013 after that; a flight carrying a GPS satellite which is currently scheduled for October. Delta 363 was the nineteenth Delta IV to launch from Cape Canaveral, in Florida on the Eastern coast of the United States. Launches from the east coast use Space Launch Complex 37B, a single-pad complex constructed between the late 1990s and late 2000s on the site of a former Saturn I launch complex. The original Launch Complex 37 was built with two pads in the early 1960s, and supported its first launch in 1964 – the first orbital launch of a Saturn rocket which carried a demonstration payload. In total, eight Saturn launches occurred from the complex – six Saturn Is and two Saturn IBs. The final flight, on 22 January 1968, carried the first test flight of the Apollo Lunar Module, Apollo 5. All eight Saturn-era launches from LC-37 used pad B. Following the launch of Apollo 5 the complex was mothballed in anticipation of low Earth orbit Apollo missions resuming once America had won the race to the Moon. Instead only four more low Earth orbit missions were flown, and launches were made from a modified Saturn V mobile launcher at Launch Complex 39, which was determined to be more cost-effective than reactivating LC-37 or LC-34. In the 1970s, most of the structures at LC-37 were demolished. 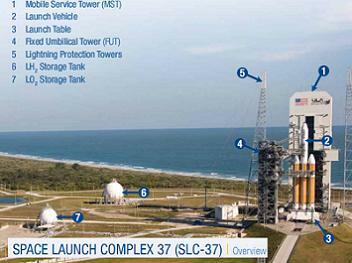 Following the construction of the new complex, the first launch from SLC-37B was the maiden flight of the Delta IV in November 2002. Delta IV launches from the west cost of the United States, such as the upcoming Delta IV Heavy mission, use Space Launch Complex 6 at Vandenberg Air Force Base – a former Titan, Space Shuttle and Athena launch complex.